Painted in oil on canvas, 31 x 46." 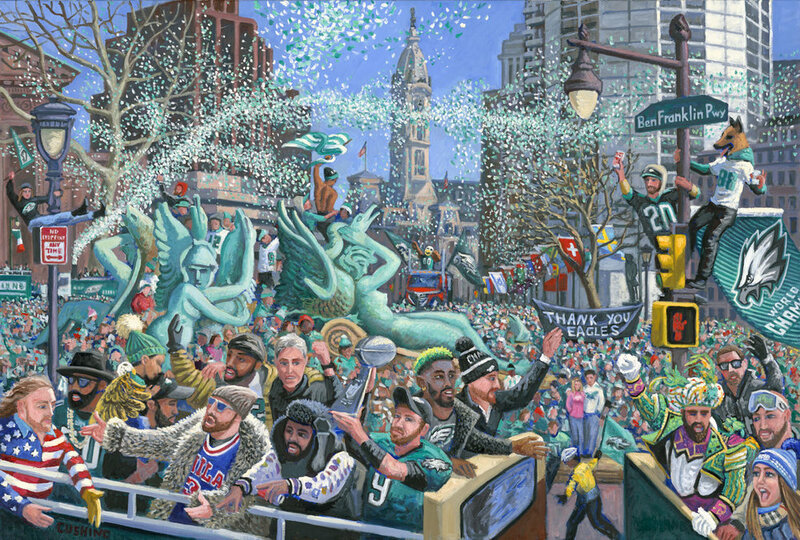 A recently completed commissioned painting depicting prominent Philadelphia Eagles players as they pass in front of the Swann Fountain, Logan Circle, during the parade following their 2018 Super Bowl Victory. The painting is AVAILABLE in two formats: as a high-quality "giclee" canvas print, and as an offset lithograph paper print. See images below of the prints, with pricing options. CLICK ON STORE page to order! Hot off the press! My "Eagles Victory Parade" painting is available as a 24 x 36" offset lithograph on 100 lb paper, signed, titled, and numbered in my hand beneath the image (see photo of the print itself). This image is ALSO available as a high-quality "giclee" canvas print in four sizes; 18x 27" ($250.00), 24 x 36" ($350.00), 32 x 48" ($500.00), 40 x 60" ($800).These are prices for unmounted and unframed print, shipped rolled in a tube shipping is $10.00 extra. I also offer mounting and framing options, and special sizes. Click on STORE page to order or call me for details at 267-679-7853.